The relaxed routines, slower pace and calmer environment that I had become so used to during those summer months are gone, fleeing faster than a baseball crushed by Giancarlo Stanton. And I’m still struggling to catch up. I feel like that one kid during P.E. class in elementary school that always struggles to keep up with the rest of the group on that one-mile run, falling further and further behind and desperately trying to catch up and keep pace. I’ll be honest: Lately I haven’t been “feeling it.” I get to Friday evenings feeling like a boxer getting pummeled by Mike Tyson and then saved graciously by the bell. As I head back to my corner, bruised and confused, I’ll lose sight of who I am and why I do what I do. Something about changes in schedules and routines, even minor ones, always throws me into a flux. And then I do what most stubborn men usually do -- I'll rely on my own strength and ability to stick it out and weather the storm. And about 100 times out of 100, I’ll wind up in a ditch feeling exhausted and overwhelmed. And then God nudges me on the shoulder: I’m still here, you know. He always is. When I reach the end of myself, God is always there to remind me that He is able. Able to intervene on my behalf. Able to give me the strength I need to carry on. Able to give me rest when I’m exhausted from trying to run the race on my own. He is able. And even when I make the same mistakes over and over, He is still willing to pick me up, dust me off and help me start over again. That’s grace and faithfulness I’ll never be able to fully understand and I’ll never be able to thank God enough for. One of my favorite interactions between Jesus and the apostle Peter came when the apostles were out on a boat in the middle of a storm as Jesus was walking towards them -- on the water (See Matthew 14). When Jesus called for Peter to walk towards Him, the apostle -- with his eyes on Jesus -- took a step off the boat. And then another step and another and miraculously enough, he was doing the impossible -- he was walking on water. But then Peter did what most of us would probably do: he started to look around and saw the strong gusts of wind, the raging waves, the dark clouds overhead and he freaked out. The moment that Peter took his eyes off of Jesus, he sank like a rock (kudos if you get the pun there) because he let his fear overshadow his faith. When our focus is on Jesus, when our lives revolve around Him and His plan for our lives and we step out in faith, amazing things happen. But the second we lose sight of our Savior and dwell on our surrounding circumstances, we sink -- just like Peter did. Jesus gives us the strength, the confidence, the purpose, and everything we need to accomplish what He wants to do in us, for us and through us. Whether the seas of your life and mine are calm or stormy, our eyes need to stay fixed on Him. Feed your faith instead of your fears. When we let our schedules dominate our lives, our identity will undoubtedly become muddled. Some days, I start to wonder Who am I, really? It’s a temporary identity-memory lapse; I become so consumed by my daily schedule and getting everything done that I forget who I am. But then it comes back to me. I am still a child of God, so I must seek Him out daily. I am a writer, so I must make time to write. I am still a son, a brother and a friend, so I must make an intentional effort to spend time with friends and build those relationships that matter. Things become a lot more clear when we remember who we really are. Our identity should determine our schedule, not the other way around. That’s what it’s all about. Four words, two commands: Love God. Love people. No matter what my Google Calendar looks like or what projects I need to complete or what errands I need to run, those two objectives should serve as the motivation for all that I do. Will I be perfect in doing so? Absolutely not. But we should strive to love others the same way God loves us and to live a life of worship, a life completely sold out to God and His kingdom. Don’t get so lost in the craziness of now that you lose sight of the big picture of eternity. More often than not, the changes that happen around us are out of our control. That’s life. But we do have a choice when it comes to our response to change. Will I try to do things my own way and complain about it? Or will I trust God and make the sacrifices and decisions necessary to move forward? We all have to fight to make time for what is really important and make sure we are taking care of ourselves by developing healthy habits, including getting enough sleep, eating right and exercising regularly. Know your schedule and make the proper adjustments. 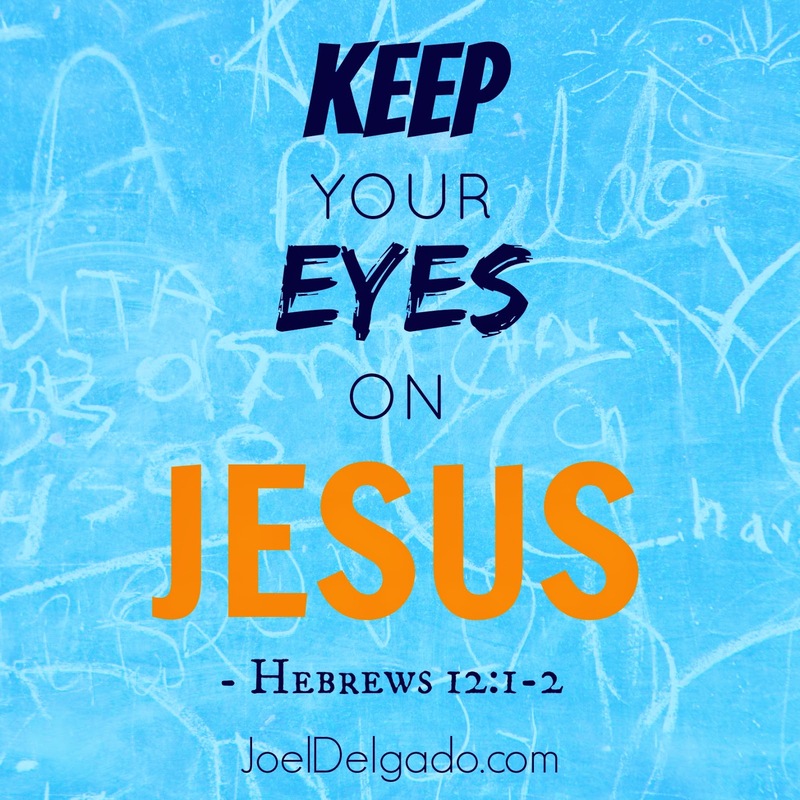 When our eyes are fixed on Jesus, when we remember who we are in Him, and when we remember the big picture and our mission and purpose in life, we can face any challenges we face and any changes we encounter. I really needed these words today; thank you so much. I've been extremely overwhelmed lately, and that illustration of Peter really hit home for me. Thanks again! God bless you! Thank you for the kind words, I'm honored! Have a great weekend!